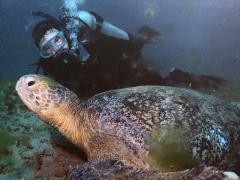 George Balazs is Hawaii's sea turtle expert. This week "Mr. Honu" spent a day visiting with the Honokowai honu and gracing us with his presence. It's exhilarating having him here--but also very tiring. George is a Dynamo, a Real-Life-Action-Figure, and we're used to a more slug-like existence. 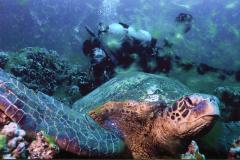 George loves his time underwater here and of course loves the Honokowai honu. When we asked him what specifically he wanted to see, George answered simply. He said he just wanted to see the "maximum number of turtles." 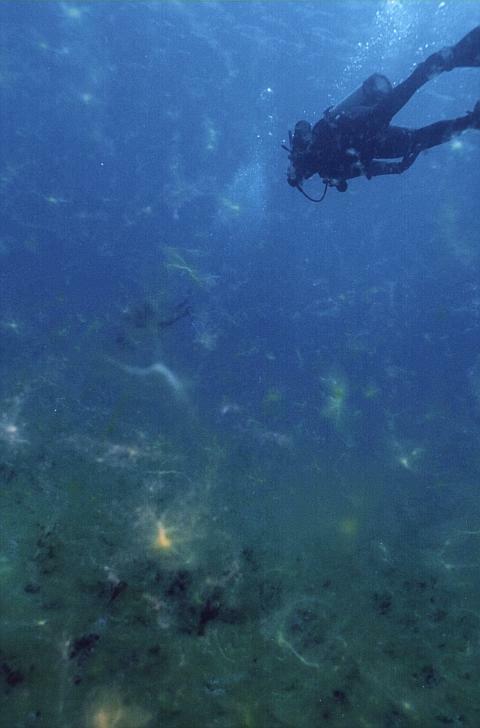 Unavoidably, this also made sure he saw the maximum amount of Cladophora algae slime as well! While here, we took George to see Ho'omalu, our resident East Pacific Black Turtle. We asked him to do a close inspection of her right eye. We also got a nice photo of the two of them. We took George to see Ho'omalu, our resident East Pacific Black Turtle. 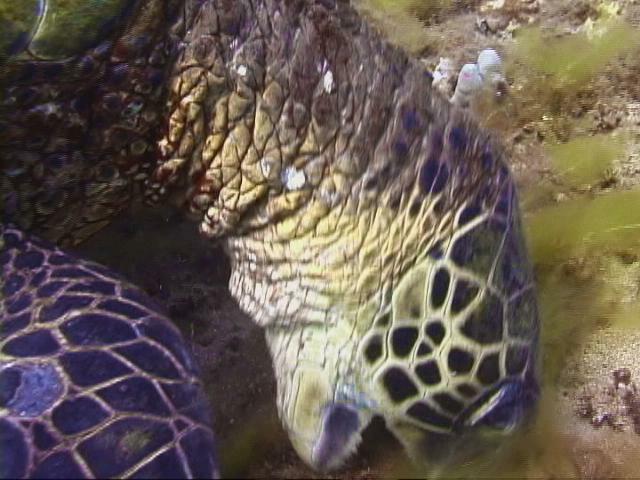 At Reef 2, a lot of honu showed up to give George their special brand of aloha. One of these was an "oceanliner," a jumbo extra-large honu he last met in 1998. Ho'oulu (known since 1992) was laid-back and cooperative in George's presence. 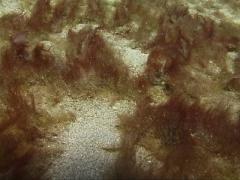 He, in return, relieved the turtle of some of her skin barnacles! George relieved Ho'oulu of some of her skin barnacles! 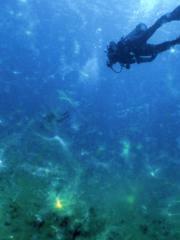 George is something to watch underwater. He's so interested in everything. Investigates everything. He's into everything--unless of course, he can't fit! He's into everything--unless of course, he can't fit! This week, we got a wonderful surprise. 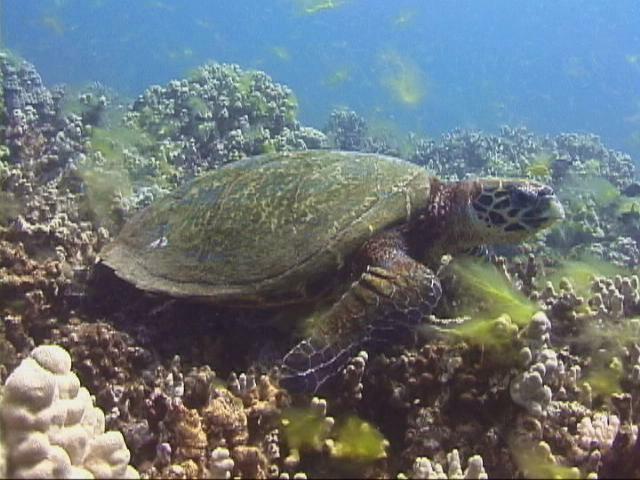 As we were swimming along Reef 2 we saw a 'ea (Hawaiian for hawksbill) resting peacefully in the early morning sun. We recognized her immediately as Kiniana, the charming little beast we met for the first time last summer. 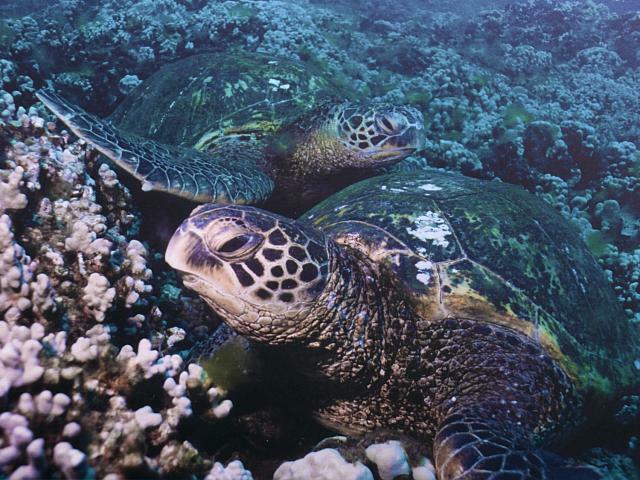 We saw a 'ea (Hawaiian for hawksbill) resting peacefully in the early morning sun. We saw her again the next morning, and a third time in the late afternoon of the next day, hanging around a "crater" she'd freshly dug. So she's around. We're hopeful this young 'ea will "hang her hat" here for the rest of the summer. Cladophora by the tons--long green strands of it. We've been reporting on this bloom since we got here. We'll be reporting about it when we leave. This thing's here for the summer. Nothing's changed about this slime except we have more of it. There is one thing that's changed, though. This week has brought with it a new Lyngbya bloom. Just like last summer, this brown "weed" erupts from the sand--and just like last summer, how odd it is to see sand to turn a fuzzy brown. How odd it is to see sand to turn a fuzzy brown. Once the Lyngbya blooms, it doesn't take long before the ocean bottom is alive and crawling with the small brown sea hares, Stylocheilus striatus. Each one's as cute as its brother. 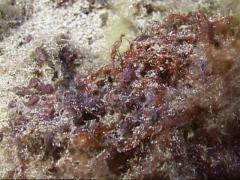 The ocean bottom is alive and crawling with the small brown sea hares, Stylocheilus striatus. Our focus this summer has shifted to foraging--specifically, what do these turtles eat? 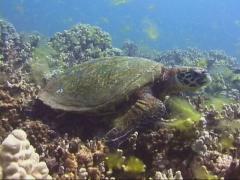 Naturally, the more we direct our attention to the honu's grazing pastures, the more foraging we've been able to document. 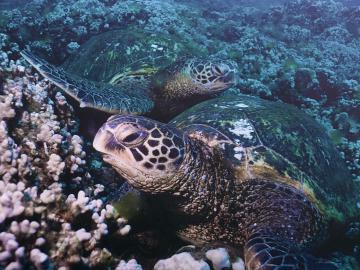 Naturally, the more we direct our attention to the honu's grazing pastures, the more foraging we've been able to document. It seems that the larger turtles target Amansia as the mainstay of their diets. As we reported last week, the Amansia here is covered with brown fuzz (which we think is likely to be Lyngbya) that in turn attracts large numbers of the sea hare Stylocheilus striatus. 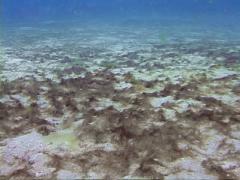 The Amansia here is covered with brown fuzz that in turn attracts large numbers of the sea hare Stylocheilus striatus. 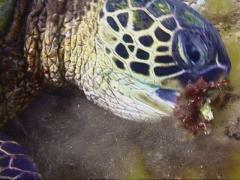 We've concluded that in addition to eating Amansia, these turtles could be ingesting Lyngbya fuzz and sea hares as well. We know that Lyngbya and sea hares are associated with three marine toxins: Lyngbyatoxin, Aplysiatoxin, and Debromoaplysiatoxin. What does this mean? Is this harmful to the turtles? We simply don't know, but these questions are being investigated. 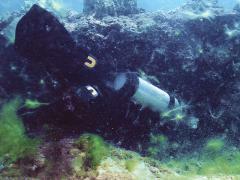 A natural consequence of documenting green turtle foraging is that you also develop a keen interest in seaweeds and algae. 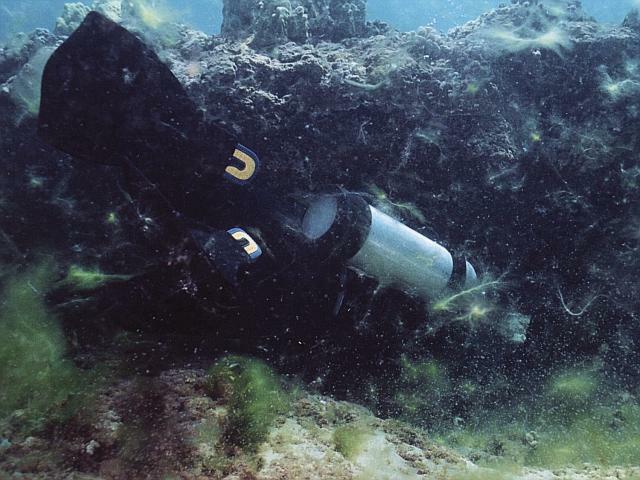 When you're interested in seaweeds and algae, it's just a baby step until you become interested in seaweeds and algae that have gone through a turtle's digestive and excretory system! Of course, it's necessary to wait until the turtle is "done" with this plant material. So this year we're keeping a vigilant eye out for turtle feces. 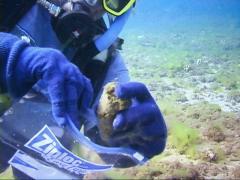 We've determined that it makes sense to look for turtle turds in the turtles' foraging pastures. We've discovered that if we patrol the pasture in the late afternoon, we will often find turtles foraging. 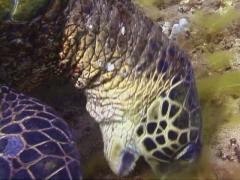 This week, in late afternoon, we sighted two green turtles foraging side-by-side. We documented them feeding for a while, then inspected the area for turtle turds. We struck it rich! We found two and quickly bagged them in Ziploc bags. This material will be sent to Honolulu for analysis so that the plants that these turtles consume can be properly identified. 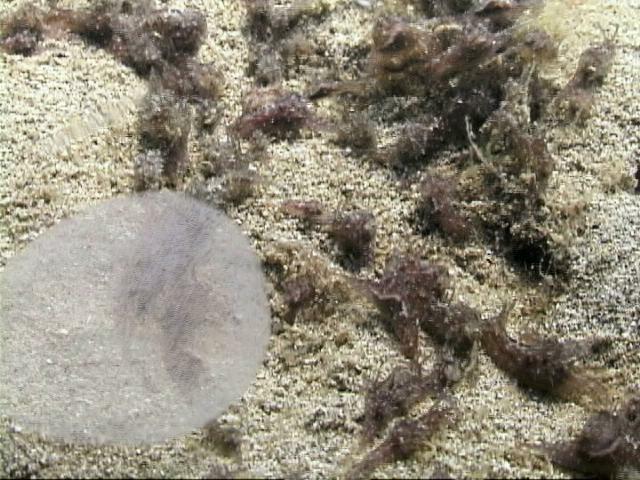 Algae, seaweeds, brown fuzz, seahares... it's time to talk turtle! The turtle in the foreground is our Grande Dame. The turtle in the foreground is our Grande Dame. Her name is Tutu and she bears tags U 521. Records show that she nested for the first time in 1988. We first saw her in 1990. 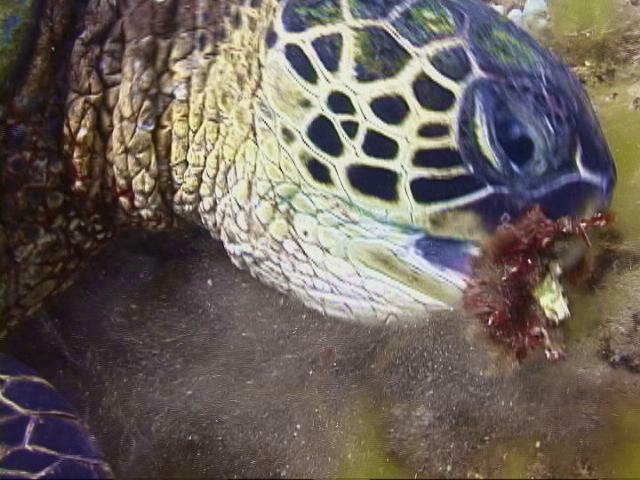 She has migrated to the honu's nesting grounds at French Frigate Shoals several times since then. Tutu is big and gentle... and she is beautiful. We love her.